First the Tide, Then a Tropical Storm the first two weeks of Louisville Football have been a wash.
We had such a build-up to the start of the Louisville Football season. So much build-up that the head coach was predicting a victory against college footballs best team. The players seemed confident and even started the game in Orlando with a little swagger in their step. They were playing some good football. Puma looked poised, the Oline blocked, the running backs were running downhill, TE’s looked good, WR’s running crisp routes and even the defense made some good plays. Things seemed to be going as expected for about a quarter then the wheels started to fall off. So much so that the coaches were having gaffs. After that game, I was able to put things into some perspective taking into account that they did play the first game of the season against the Tide. We did some things well, and it was a game to build on. Our young guys got hit in the jaw and didn’t respond well. Heading into the Indiana State game I expected the monsoon rains and knew it would be a student body left, student body right kind of night. Not very entertaining but expected a solid win. I did not expect the breakdowns on offense, and I sure didn’t expect to see the Indiana State O-Line housing our D-Line at times. Knocking them off the ball. I expected inconsistency with yet another new coaching change but come on… how are you controlling the line of scrimmage on downs against the likes of Alabama one week and losing that battle to an FCS school the next week. Doesn’t add up. Or does it all add up? Did opening up the season against such a dominating opponent backfire? Did some of these young guys have that confidence tested too early? Did they completely put the last one behind them when heading into the game week with Indiana State? Did the torrential downpours affect the offense that much? To look that bad? Was the Louisville defensive front that beat up and did the weather affect their gameplay? I’m willing to call it a wash.
That’s right… these last two weeks have been a blur. Louisville fans drove 13 hours to watch the season opener and then had to set thru a monsoon for the home opener. The expansion did not get the appreciation it deserved and we didn’t even get a Card March. I don’t imagine that these first two weeks have been great for the players either. They did get knocked down to size pretty good in that first game. Confidence was shaken. Then they don’t get a Card March and have to sludge thru a monsoon all night against an FCS school in the home opener. Not much fun at all. They did enough to get the job done and did have some pep in their step to end a miserable night. I’m excited about this weekend. 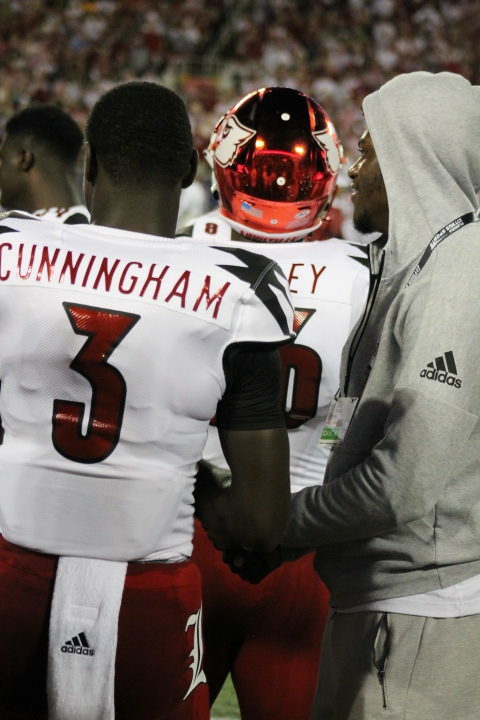 I liked what I saw out of Malik Cunningham Saturday night. If you paid attention at the Spring Game you know his game is very Lamar’esque. Bobby will now have a few more options. And this could give Puma a little nudge. He has to be the leader of this team Tide or monsoon be damned… It’s good to know that there is someone ready to step up if he doesn’t. Don’t think we have a QB controversy yet. I like what Jeremy Smith brings to this team. He hasn’t missed a step. Our defense is beaten up. The best player Jonathan Greenard is out indefinitely after injuring his wrist against Bama, and Dorian Etheridge suffered an ankle sprain against Indiana State. A lot of tackles here. I’m beginning to worry that issues go much deeper than a few injuries on this side of the ball. Charlie Strong built a defensive culture so strong that it lasted up to Grantham’s last season. He was able to use Strong’s mojo for a few seasons. I’m worried about the current culture. Too much turnover and not enough consistency has left a big hole. Coach VanGorder is getting paid handsomely and he has some athletes so I’m not giving up hope yet. This could be a week for guys to gain some confidence and more experience. Like Jarrett Jackson. This dude wears #8 and his last name is Jackson. He was No. 56 on ESPN’s Top 300 defensive linemen list and one of the top high school defensive lineman in Florida a season ago. Jackson has 7 assisted tackles this season. Guys like Amonte Caban and Tabarius Peterson. They both were trending upward at the end of last season. Michael Boykin and Derek Dorsey could use another game before heading into the conference grind. Boykin is still adjusting to the speed of things. He was dominating in Juco last year. Dorsey has a mean streak about him but needs to be in right spot. GG Robinson has to step up and lead with Greenard out. GG can be a beast and has 7 solo tackles in the first two weeks. This defense is wet behind the ears and not from the rain last week. I know that a hurricane is barreling up the east coast. But weather should not be an issue this Saturday night when the Cardinals play WKU. It should be an awesome night for a football game. I expect the tailgating lots to be packed early, I expect a great Card March, I expect the place to be packed, and I expect the expansion to get the crowd it deserves. I hope Louisville plays better and shows some promise. We will know a lot more about this team after Saturday night. Even though these last two weeks have been a wash I still have hope the season won’t be.